HMD Global, the Finnish giant that’s behind the successful revival of the iconic Nokia brand is currently on a high roll. It sold over 70 million Nokia-branded phones last year, with the budget segment seeing quite a lot of traction. Starting off with Nokia 2.1, this is an incremental upgrade to Nokia 2 but the new device adds dual front-firing stereo speakers and upgrades the OS from vanilla Android to Android Oreo (Go Edition). 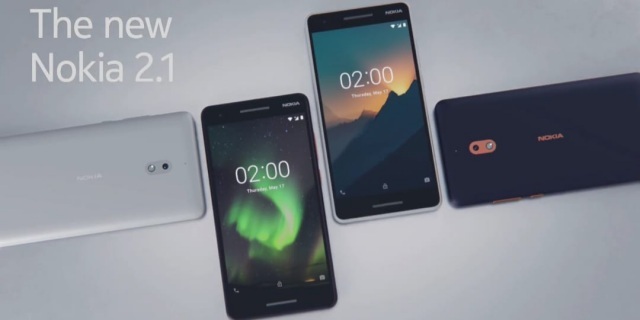 This device now also joins the Nokia 1 in the Android Go family, which is a lightweight version of Android designed for low-specced phones. The Nokia 2.1 features a large 5.5-inch HD screen but it’s still the usual 16:9 resolution and you see considerable bezels on this device. It’s powered by the Snapdragon 425 chipset, coupled with 1GB of RAM and 8GB of internal storage, which means it will have a ton of benefits with Android Go. The device also features an 8MP autofocus rear camera and a 5MP selfie camera, which should get the job done in the budget segment. The highlight has to be the 4,100mAh battery pack that Nokia claims will last you 2 days. The new Nokia 2 will retail at an average global price of $115 (approx Rs 7,999) and will come in three metallic colors: Blue/Copper, Blue/Silver, and Grey/Silver. 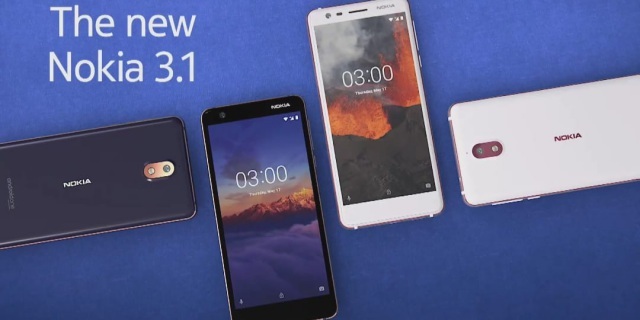 The Nokia 3 refresh comes with a similar design, with a polycarbonate back and a 2.5D curved glass front, along with a modern screen and internals to fall in line with 2018 standards. The Nokia 3.1 sports a 5.2-inch HD+ with an 18:9 aspect ratio, which is the biggest design change. This time around, the device is powered by a MediaTek 6750 processor, coupled with two RAM+storage combos – 2GB+16GB and 3GB+32GB respectively. The company claims that it will offer 30% better performance than the original Nokia 3. Nokia has upgraded the rear camera to a 13MP sensor with f/2.0 aperture whereas the front sensor still remains the same. There’s also a 2,990 mAh battery pack, which is decent and should last you at least an entire day on single charge. You do get Android 8.1 Oreo out-of-the-box, thanks to the Android One program. The Nokia 3.1 also comes in three color variant, namely Blue/Copper, Black/Chrome and White/Iron. It will start retailing from next month, with the lower-end 2GB+16GB variant being priced at €139 (approx Rs 10,999) and the 3GB + 32GB variant is priced at €169 (approx Rs 13,499). 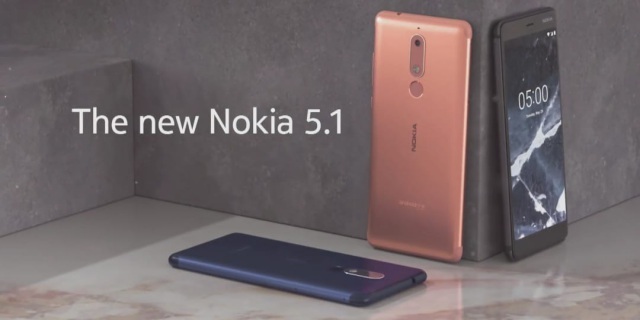 Now, coming to the most premium phone of the lot, the Nokia 5.1 has been milled from a single block of 6000 Series Aluminum which gives it that premium look. The company has refined its design by moving the antenna lines to the edges, and the fingerprint scanner around to the back. The new Nokia 5 features a taller 5.5-inch Full-HD+ IPS LCD display with a 443 ppi. It is powered by the MediaTek Helio P18 chipset, coupled with the same RAM+storage combo as the Nokia 3.1. HMD Global says despite the MediaTek processor, the 5.1 has gets a performance boost of up to 40 percent with the new internals. The rear camera on the Nokia 5.1 has also bagged a spec bump and now comes with a 16MP sensor with PDAF and dual-tone LED flash. The selfie camera still is the same 8MP shooter. You get a 2,970 mAh battery pack and Android 8.1 Oreo out-of-the-box. As for the pricing, the Nokia 5 starts at €189 (approx 14,999) for the 2GB+16GB variant but you’ll need to shell out €219 (approx Rs 16,999) for the 3GB+32GB variant. It will go on sale in July and will be available in three colors: Copper, Tempered Blue, and Black (coming later). So, did any of these budget and mid-range phones catch your eye? Tell us in the comments down below.